Despite a voluminous literature detailing the procedures of research ethics boards and institutional ethical review processes, there are few texts that explore the realpolitik of conducting criminal research in practice. This book explores the unique lived experiences of scholars engaging with ethics during their criminological research, and focuses on the ethical dilemmas that researchers encounter both in the field and while writing up results for publication. Who benefits from criminological research? What are the roles and impacts of ethics review boards? How do methodological and theoretical decisions factor in to questions of ethical conduct and research ethics governance? Part I, Institutional arrangements and positionality, explores the ongoing and expanding process of ethics protocol and procedures, principles of confidentiality, and the positionality of the researcher. Part II, Trust and research with vulnerable populations, examines the complexity of work involving prisoners, indigenous peoples and victims of extreme violence, power dynamics between researchers and participants, and the challenges of informed consent. Part III, Research on and with police, reflects on the importance of transparent relations with police, best practices, and the consequences of undertaking research in authoritarian contexts. Part IV, Emerging areas, scrutinizes the ethics of carceral tours and suggests possible alternatives, and offers one of the first sociological and criminological examinations of dark net cryptomarkets. Drawing upon the experiences of international experts, this book aims to provoke further reflection on and discussion of ethics in practice. 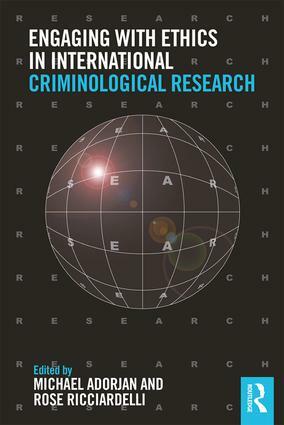 This book is ideal for students undertaking courses on research methods in criminology, as well as a key resource for criminology researchers around the world.